Must-Do Chattanooga Races in 2018! You've set your new year's resolutions: get fit, stay in shape, eat healthier. What better accountability than a tangible goal you have to train for, like a race! Races provide an end goal to work towards, whether that's to run a fast a 5k or to run your first half marathon. A registration fee and date on the calendar are excellent accountability partners that will all keep you motivated to train and push yourself! Whether you're just starting out or need a bigger, badder challenge, here are eleven races to put on your calendar for 2018. This race will not disappoint you. Although a young race, over the past 3 years the city of Chattanooga has come out strong with cheering and support throughout the race. It is a blast running through the various neighborhoods of Chattanooga, and seeing everyone out cheering. There is a large expo the day before at the First Tennessee Pavilion, and there's always great race swag for participants. There is still plenty of time to sign up and start training, don't delay! Click here for more info or to register! If you've always wanted to try a trail race, the R/C River Gorge is a fantastic chance to dip your toes into the trail world. The course has beautiful scenery with challenging a single track course through Mullens Cove loop at Prentice Cooper State Forest. For more info or to register, click here! In it's 16th year, the 65 Roses 5k has raised about $1 million for Cystic Fibrosis. This year they are having a special guest, Olympian marathon runner Meb Keflezghi! You can sign up for the VIP ticket and have a chance to meet him in person, and it's all for a great cause! For more info or to register, click here! This year will be the 50th running of the Chickamauga Chase, solidifying it as a Chattanooga classic, and must-do race for locals! This event has something for everyone, and we mean EVERYONE. From a road 15k race to a 8m trail race to the Kiddie K, this race is perfect for the running family. 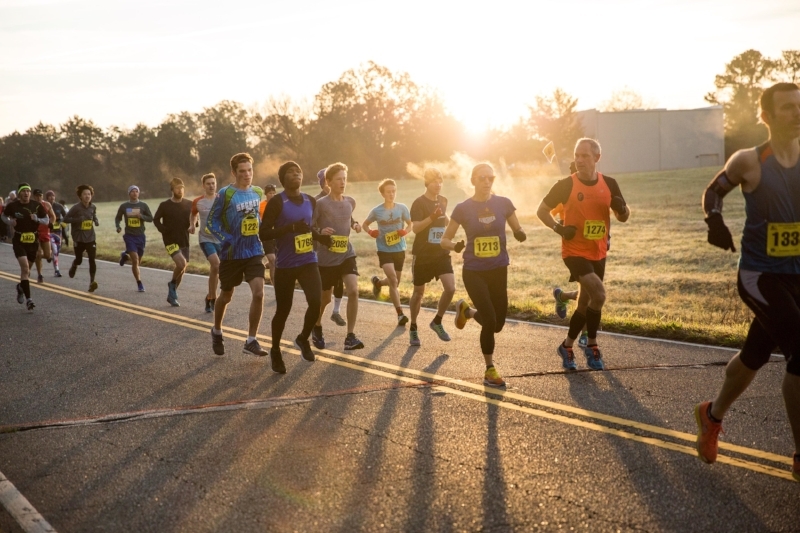 Road runners, trail runners, walkers, and kids will all enjoy a beautiful day of racing at the Battlefield. Not to mention the awards for the top finishers are Civil War bayonets! For more information or to register, click here! In its 51st running, this challenging and hilly road course shows no mercy until the fast, flowing, downhill finish. But let's be real, this race is all about the after party! In recent years, the Chattanooga Chase has been sponsored by local restaurants who have up'd the heigh of the post-race festivities, providing food and drinks to all participants and families. Join us for a fun race kicking off your Memorial Day. For more information or to register, click here! Chattanooga is known for being a triathlon city with the Ironman 70.3, full Ironman, and in 2017, we hosted the Ironman 70.3 World Championships. If you've been inspired by all the men and women in space helmets on bikes, before you sign up for the full 140.6 miles, start with this competitive but friendly Chattanooga tri. The Waterfront Triathlon offers both sprint and olympic distances, perfect for a beginner triathlete, yet challenging enough for advanced racers. For more information or to register, click here! Another classic Chattanooga race in its 45th year running! This rolling course on top of the ridge has breathtaking scenery the entire route. In August, the weather is sure to be hot and humid, so stay hydrated, and challenge yourself to take on the ridge! For more info or to register, click here! In its 3rd year, the Cam Run 5k and 1mile is very dear to our hearts. Cameron Bean, a former Fast Break employee, was tragically killed while running on Moccasin Bend Road which is the location of the race. The 5k in the morning is open to everyone! The top 25 male and female winners from the 5k will have the chance to compete in the 1 mile event that evening as a part of the River Gorge Omnium bike race. Click here for more information or to register! A race through history! This rolling course takes your through beautiful Civil War battlefields and around historical moments, memorials, and canons. It's a great race to go after that elusive Boston Qualifier! Everyone can participate with distances from the full and half marathon to the Jr. Marathon. For the Jr. Marathon, kids log 25.2 miles throughout the year, and run their final momentous mile on race day. For more info or to register click here! There is no other Turkey Trot in Chattanooga like this one. For years, this race has brought out before the devouring, football and food coma's start. Burn the calories before you eat them! Proceeds go to the Kidney Foundation of Chattanooga. Click here for more info or to register! It's not just about how fast your are, but how old you are! Experience a different type of race with an age graded start. Each age group has a different start time that levels the playing field for a chance to win the Golden Antlers! The course is at Reflection Riding Arboretum. Participant are encouraged to bring a white elephant gift for the prize table! For more info or to register, click here! There are SO MANY great races in Chattanooga that we've run out of room! These honorable mentions are more that the Fast Break crew loves and runs. Click on each one for more info or to register. Good luck with your fitness goals this year!